Sorry for being so silent lately. With a birthday and a trip to NYC this past week, I've been crazier than usual, if that is possible. But I am so glad to be back and now I am full swing into decorating the house because I am hosting my annual cookie exchange this weekend. I am never this late but some years you have to say "whateva" and do what you can. 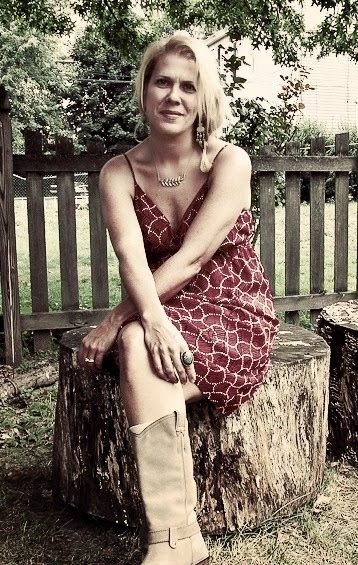 I'll post some pics of the abode when I get a minute. You do know that could be well into next year, right? Just didn't want you holding your breath and then I'd be responsible for all 25 of my readers fainting dead away. Not good for Christmas spirit. 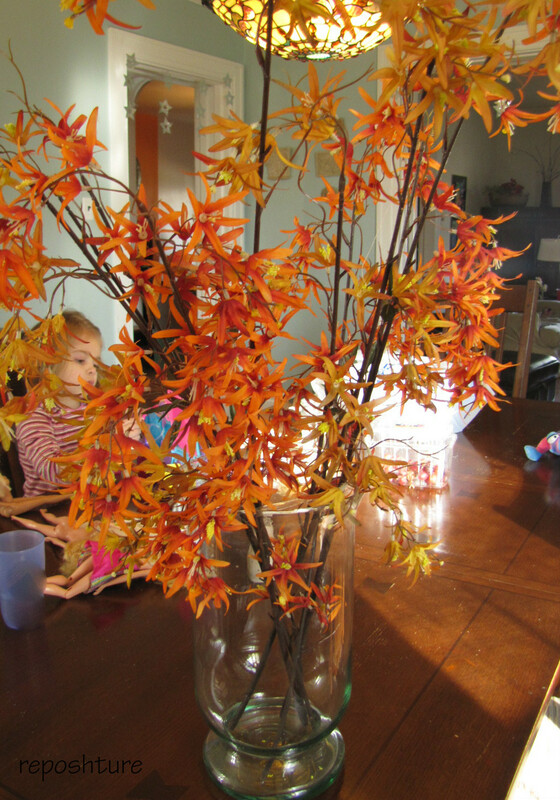 So while I was decorating I wanted to use some branches from our concolor tree around the house. It is thick, so soft, (really concolors have the biggest softest needles I tell ya'), and BIG. With all of our mismatched ornaments on it, it looks like happiness threw up all over it. Beautiful chaos. 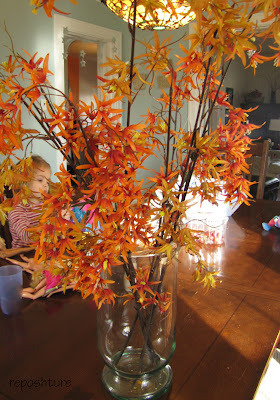 But as usual, I ran into the age old problem of how to make the branches look good in the vase. 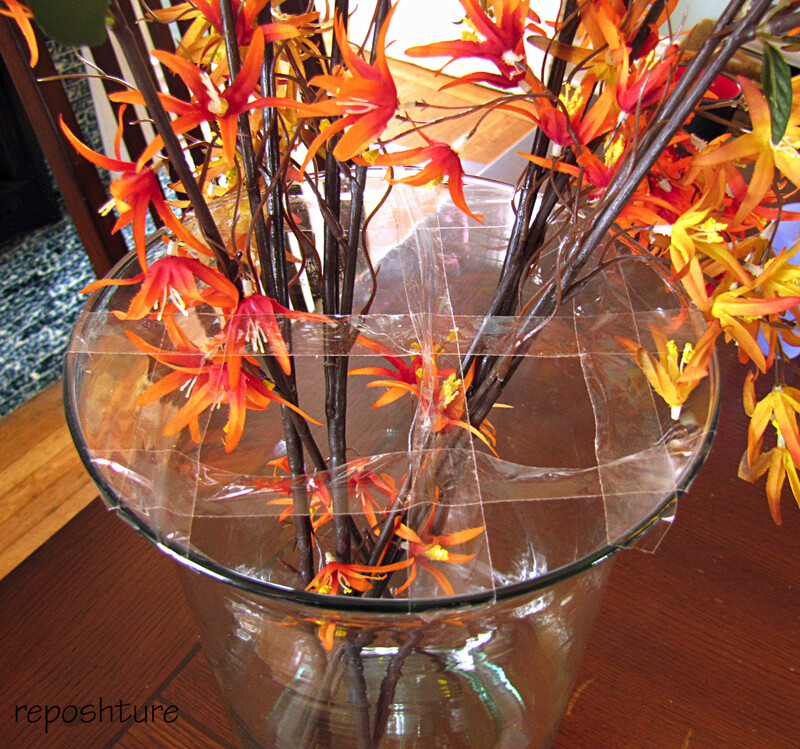 Well, tonight I am going to share a little trick to use to make your flower (branch) arranging go much smoother. 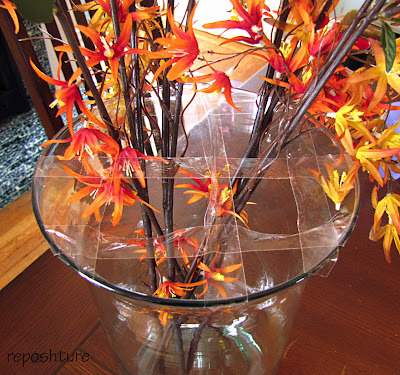 Have you ever tried to put plain branches in a clear vase? These look so perfect! How did they do it at House Beautiful? Mine used to look like a middle school dance with all the branches standing at the edge of the vase, no one lookin' at the other. Then I put on some great hip hop music and the branches decided to mingle. The secret is clear tape! 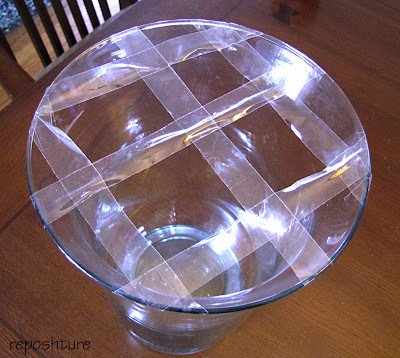 Add tape to the lip of the vase like above. If you have thinner branches add a few more lines of tape to the grid. Then add your branches inside the grid openings. No I do not decorate for Christmas in golds and oranges. It is just I had these pictures from Thanksgiving and did you read the first part of this post about having no time? Ignore the Barbie's in the background. They are getting their hair done at the salon. Instead look at how nice and straight the middle branches are. Keep your taller branches in the middle and the shorter ones to the outside and you will always have a great arrangment! Enjoy decorating your humble home and don't forget to give generously to others this season. Be it gifts of food, gifts of time and service to others, or just plain old presents given with a joyful heart.......Give and be invited into the bigger picture of life and love.